The subject of the one-half ounce gold medallion for the second year of the American Arts Commemorative Series was author Willa Cather. She is well known for her novels depicting frontier life on the Great Plains such as O Pioneers! and My Ántonia. She was awarded the Pulitzer Prize for her novel One of Ours. On the obverse of the medal is a right facing three-quarters portrait of the author with a serious expression and dressed in a lightly patterned blouse. Her hair is pulled back and bound behind her head. The reverse carries a depiction of a woman with a plow in an agricultural field. The crop fields and clouds can be seen into the distance. 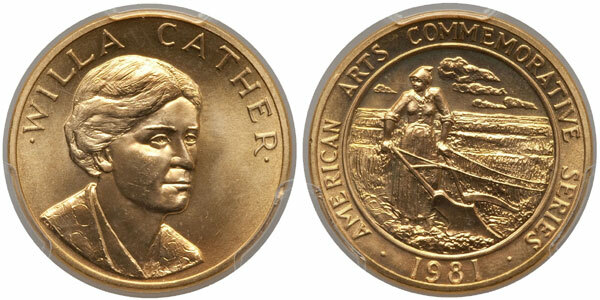 The obverse inscription reads “Willa Cather” while the reverse reads “American Arts Commemorative Series” and “1981”. A slight change in composition is seen for the series starting this year, with the composition now including a minor amount of silver intended to improve the overall appearance of the medals. The previous styrofoam packaging was also replaced by a more formal gift box, which also included an insert containing information about the life of the author. After the high production of the initial year was met with muted demand, the Willa Cather Gold Medallion had a considerably smaller mintage of 200,000 pieces. From this amount 97,331 pieces were sold across individual sales and later efforts through telemarketing sales of complete sets of medals. This issue remains one of the more readily available issues of the series and can typically be acquired near its precious metal value.